Ok. Maybe I need therapy. Whatever. 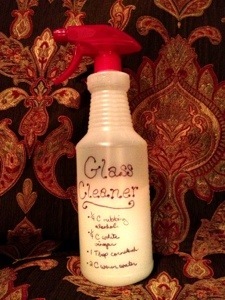 But seriously, you’ve got to try this Homemade Glass Cleaner! I found this recipe on Pinterest claiming that it is the best homemade recipe, but really, it works way better than anything I’ve ever bought. WARNING though, when you spray and first start wiping, you’re first instinct is to believe you’ve been pranked. It makes an ugly, smeared mess for about 5 seconds. Keep wiping. Suddenly, out of no where, the glass clears, and it is PERFECT. Not only does this stuff work better than anything store-bought, you probably already have the items you need to make it! Combine all of the ingredients in something that has a spout; mix well and pour into a spray bottle. Shake well before each use. Anyway, give it a try! Let me know what you think!